We first needed to decide where to mount the display. 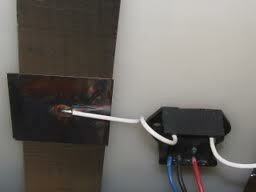 It needed to be easy to see and have good access to run the wires from the power source to the tank. A convenient spot on the bulkhead directly behind the head was perfect for us. It began with cutting a hole for the panel. We posted our procedure for doing this in an earlier post, so I won't repeat it again. The power connection was run from our main DC panel and the monitor has its own breaker switch. 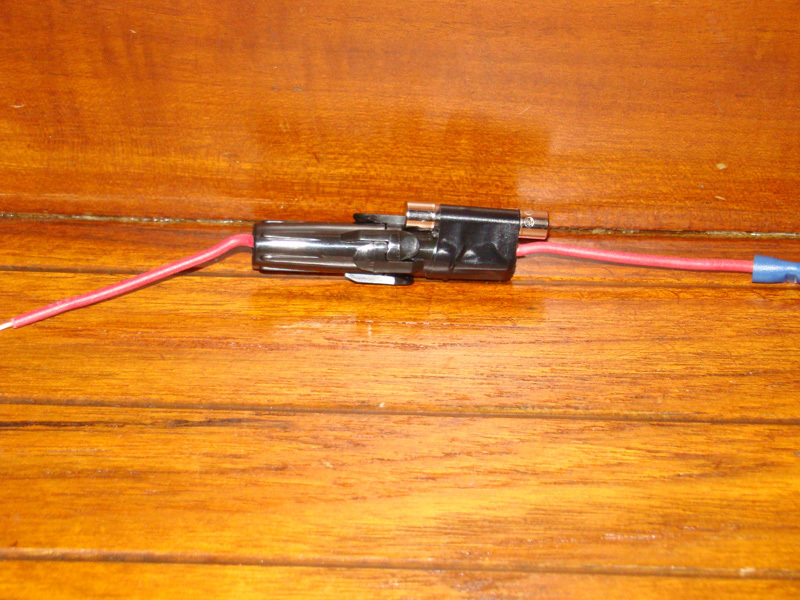 Even though it's connected to a breaker, we also installed an in-line fuse per the manufacturer's instructions. 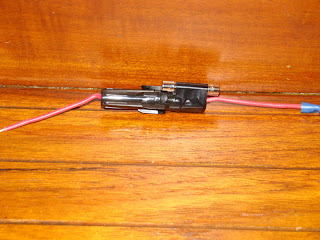 All of the in-line fuses on Beach House have a spare fuse taped to the fuse holder, so if it blows, there is no hunting for a replacement and hoping we have the right size. This has made the replacement process quick and easy. 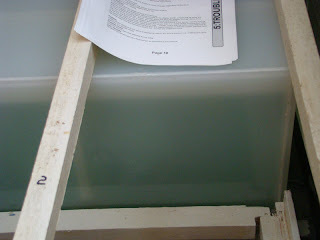 With the panel in place and the power wire run and connected, the next step is to install the sensors on the outside of the tank. We chose the external, non-contact sensor. There is no need to drill holes in the tank, no moving parts to care for or any sensor in the tank that would need cleaning. With our custom made "plastic" tank, this kind of sensor is ideal. 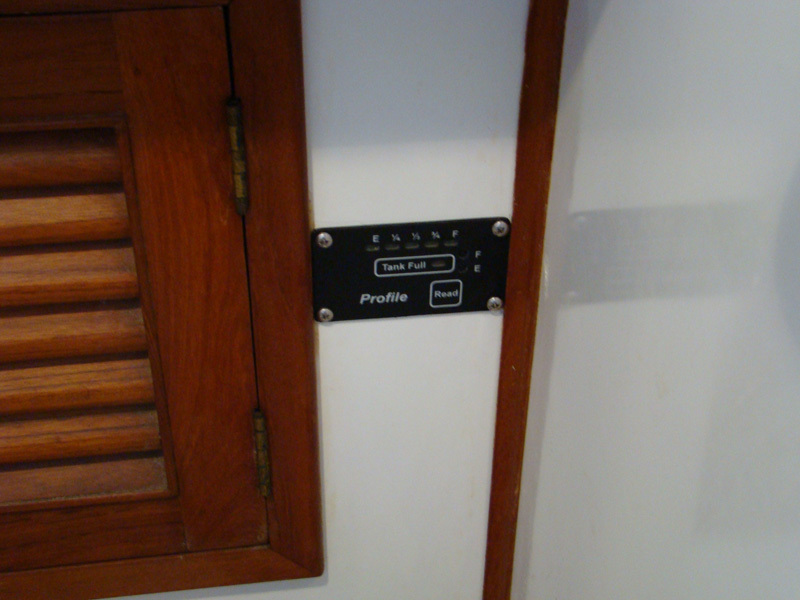 The installation of the sensor is extremely easy and only took a few minutes. 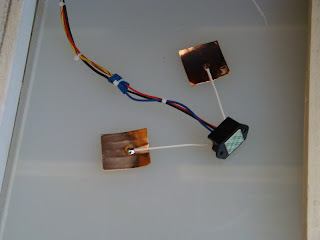 The sensor module is wired to the display panel, two self-stick strips of aluminum are attached to the outside of the tank, the self-stick copper patches attached to the module are stuck over the aluminum strips and the module is secured between them via a piece of self-stick tape. And that is all there is to it. There is one more additional step and that is calibrating the tank both empty and full. 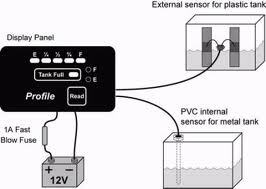 This allows the sensor to read and display how much fluid is in the tank. 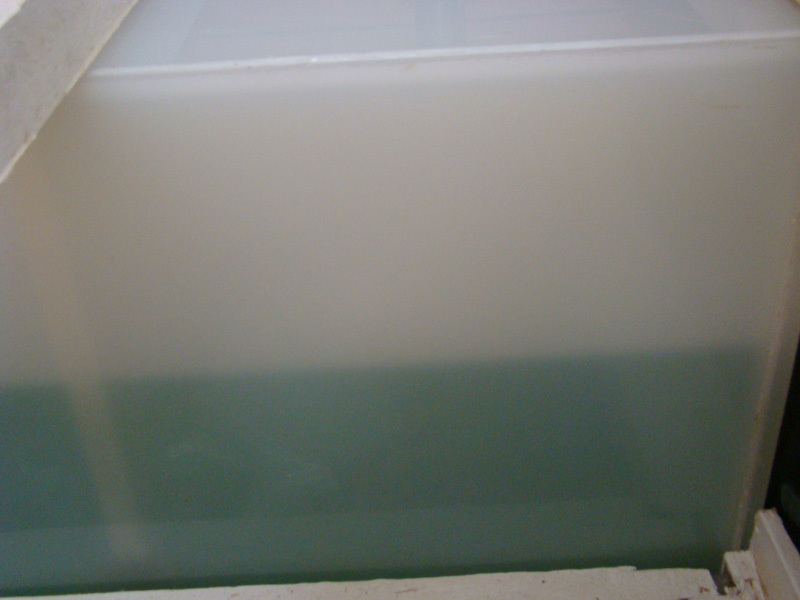 Our tank is opaque and you can see the fluid levels if the drawer next to it is removed. But we prefer a bit easier and more precise way to tell when the tank needs to be pumped out BEFORE it is over full. The first part of the calibration is to pump the tank as empty as possible. Most tanks will still have a small amount in the bottom, but that is okay and preferred during the calibration process. Once empty, the buttons are manipulated according to the installation manual. 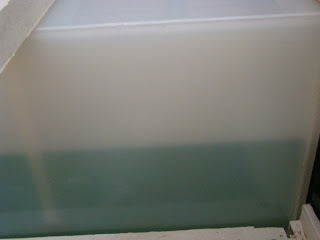 We then filled the tank with our water hose, being careful to stop at about two inches above the top of the tank. This would give us a little cushion when the monitor reads full and we would still have a couple of flushes to carry us through if we needed them. Once the tank was full, again, a simple manipulation of the buttons on the display calibrated the monitor for a full tank. The entire installation took very little time and was one of the easier installs we have done. We highly recommend this unit. Oh yes, I did mention some major service for our Ford Lehman 120. The engine has performed flawlessly since we have owned the boat. But it has had a minor problem with oil weeping from where the head bolts on to the top of the engine, near the rear of the head and engine. I re-torqued the head bolts when we were in Reedville, Virginia and it slowed the problem down a bit, but did not stop it. 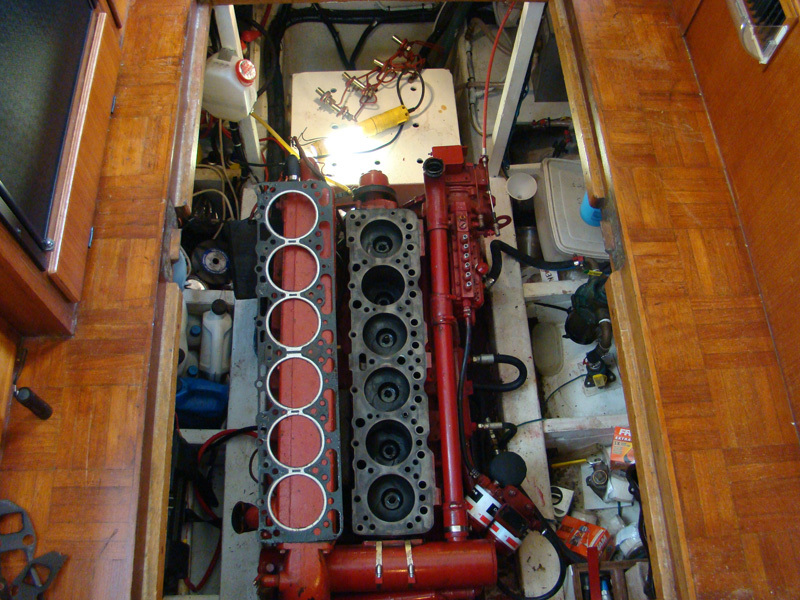 So we decided to pull the head, have it checked and machined if necessary, and at the same time, replace the injectors, new valves and seats, a new head gasket and exhaust manifold gasket and do a valve adjustment. Our plans to do the Great Loop will mean thousands of miles that we will have to motor so we want the motor to be in tip-top condition. The top of the pistons and the cylinder walls all looked excellent and even the valves were in good shape, but since we had everything apart, it only made sense put new valves in since they are very inexpensive. We'll let you know how it all turns out. This question is regarding holding tank vs treatment. First let me start by saying we are not boat owners at this time but researching for retirement in a few years. We have been campers and find holding tank (30 gal) to be a pain. Won't take long to fill one up if both gray and black are to be combined in a boat. We have been lucky I guess in that we've always been able to dump free. Doesn't a marina charge to dump? What are the adv. fees. Knowing a little, from some research, about NDZ mainly in the northern states of the ICW I understand the need for holding. Also from what I've read, many state that the equipment used on boats for treatment are far better than what most treatment plants put out. Anyway is it possible to have both with say a valve to switch from one to the other? So when in areas that aren't restricted there's no need to be concerned with paying or finding somewhere to get pumped out. Rob, Excellent questions. The typical charge for a pumpout at a marina is usually about $5.00 but some can be higher. Marinas that have had their equipment subsidized by the state are limited in what they can charge. 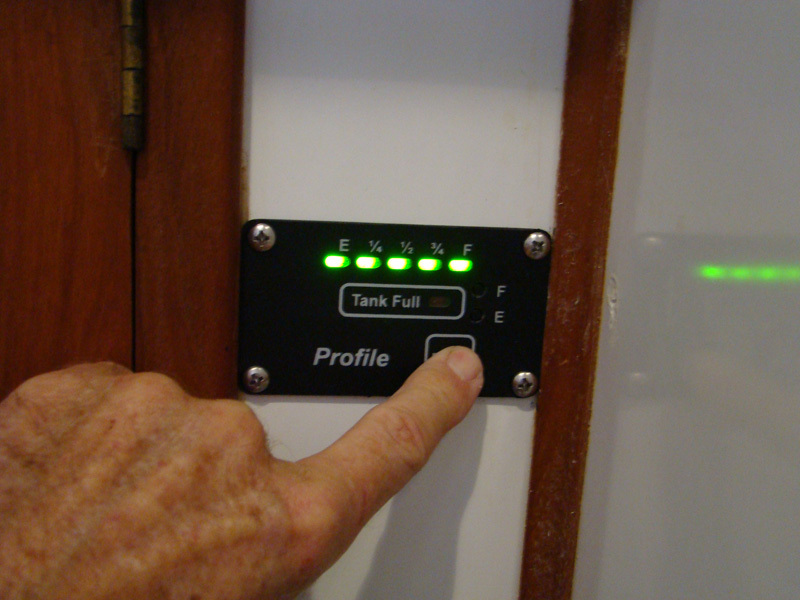 Some marinas provide free pumpout with fuel purchases or included in dockage charges.